Treat Yourself | Eating well, with creative recipes, to follow the Fasting Lifestyle according to Michael Mosley's "Fast Diet." People go on diets because they want to change something about themselves: their weight, their clothing size, their body shape. All of which makes it sound as if they don’t like themselves. So they eat as if they want to punish that uncooperative body of their’s. Let’s change that mindset. You need to like yourself enough to want to have a healthy body. And that is why the menus I suggest for Fast Days are not only low in calorie but full of flavor. By making the food nutritious, and pretty, and good to eat, you can treat yourself and still achieve your goals of a slimmer, healthier you. This recipe is straight out of Jerry Willis’ Powder Mill Pond Restaurant where it was a favorite. Alas, brunch is not served at Jerry’s Marzano’s Tratoria but you can enjoy this at home. Whisk the eggs [salt and pepper may not be needed depending on the seasoning of your salmon]. Pour into a pan which has been sprayed briefly with cooking spray. Before the eggs set, add the salmon and scallions. Scramble to taste. Brew your beverage and take the previously-made smoothie from ‘fridge. Plate with fruit. 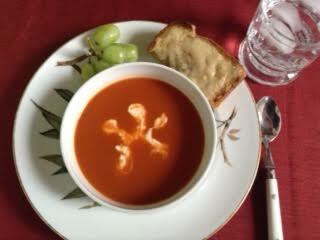 Tomato Soup w/ Sandwich 278 calories 8.3 g. fat 16.7 g. protein Comfort food can be low in calories. The soup recipe is from Fresh Ways with Soups and Stews, published by Time-Life Books. HINT: the soup is enough for 2 servings, so it is worth the time to make enough to freeze for later. Prep Sandwich: 1 slice 70-calorie bread [Nature’s Own] 1 slice Swiss cheese from the deli 1 oz ham, 97% fat free Cut the bread in half. Cut the cheese slice in pieces the size of the bread halves. Construct a sandwich of bread, ham, cheese, bread. Save out one bread-sized piece of cheese. Wrap in foil and put in the toaster oven at 350 until cheese is beginning to melt on the inside. Unwrap the sandwich and put the remaining cheese on top. Toast the sandwich so that the cheese becomes melted and might start to brown. Finish Soup: 2 tsp ricotta or small-curd cottage cheese & 2 tsp plain non-fat yogurt Puree the soup in food processor or blender. Pour half of it into a freezer container to cool before storing. Put the soup in the serving bowl. Stir the cheese and yogurt together and put a large dollop in the middle of the hot soup. Use the tip of a knife to pull the mixture out from the middle in several radiating arms. A few grapes add a dash of color.